When you are watching Monday Night Football, what is running through your mind? A crunching tackle sends your arms flailing in the air, the pretzels fall to the ground and beer ends up on your shirt. Are you thinking about why #84 is wide right and #88 in on the bench even though he holds the teams touch down reception record for all time. Of course not, all you care about is the hard hitting, intense game that you obviously wish you were at or think you are at by the way you yell at the official as if he can hear you. What about when you are watching one of your children play baseball? Why do you think your child was replaced at shortstop by another, equally talented child shortly after the coach was approach by the other child's father. From six-year-old recreational leagues all the way to the pros, the role of politics within sports is evident. In the last five years, the Seattle Mariners have won two division championships and one wild card. They had never dropped below third place in the division for those five years. 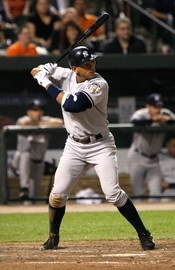 In fact, the last five years have been the winningest years in Mariner history.# Knowing this what could justify leaving this winning team, as a star shortstop, for a team, the Texas Rangers, whose five-year record winning could be compared to a roller coaster.# Alex Rodriguez was quoted saying that he was not leaving for the money. This came just days after he signed the largest salary contract in sports history. In this contract "A-Rod" will be granted a raise in salary if any other professional athlete is signed for more pay so he can remain the highest paid athlete in sports history. But it's not about the money, remember? Assuming that Mr. Rodriguez isn't concerned about the money, what would be the reason for demoting himself to the Rangers? Most believe the answer lies deep within the Mariner ball club, which promotes politics in the system as the reason for his leaving the team. Another popular belief for Rodriguez's move to Texas is to be a part of a winning ball club. Another example of politics swaying decisions made in athletics comes from a personal experience of mine two years ago. I was playing on a soccer team in the Premier 1 league in Washington State, which is the highest level of club soccer. The team was based out of the Wenatchee and Cashmere Valleys. In that area there are many apple and cherry orchards, which create a large Hispanic population. The roster of my team was three quarters Hispanic. During our season we beat the #1 ranked team, Sparta. As the championship tournament, The State Cup, approached we posed a threat to Sparta. Now, one of the fathers of a Sparta team member was on the board of athletics that oversaw our league. Our first game of the tourney was to be played in Wenatchee. But heavy snowfall prevented our Seattle based rival from showing up for the game. Our coach contacted the Seattle teams coach and then contacted the board. Later that week we were informed that the board had forced a forfeit on our team because our coach contacted the wrong person first. Being a single elimination tournament, we were finished before we began. We were very confused as to why we had been kicked out of the tournament until we discovered the Sparta father was the board member who notified us about the forfeit. The two previous examples have involved players and higher-ranking officials as the source of conflict and political pull. This is not the only combination between two parties that can cause politics to interrupt what the game is all about. Picture a father watching his eleven-year-old son or daughter play little league baseball. For some reason his child doesn't run out to shortstop, where he has been playing all game, for the fifth inning. To the fathers surprise another young child fills the position. As he looks towards the bench, he notices the father of the new shortstop finishing up a conversation with the coach. A few days later the disturbed father finds out that the man who was talking to his son's coach is a lawyer and a good personal friend of the coach. Is it coincidence that the lawyer's son was put in to replace the shortstop by the coach, a good family friend? I think not. Parental influence on sports teams, concerning playing time and positions on the team is key evidence that politics rule the sports world for youngsters. A similar experience happened to Nathan Alvstad, PLU soccer player, during his years on a high school soccer team. "Every year the coach was wined and dined by the senior parents, they would actually take him out to dinner and give gifts. From then on, no matter what the skill level of the senior player, he started every game. "# Robert Wright experienced the same political influence in high school baseball, "If the parents wined enough, their kid was treated like pro. "# I too went through similar corruption with my soccer team in high school. The son of a school employee had the skills of a three-legged donkey, but he made the Varsity team and shared playing time with the best on the team. Politics in sports don't only influence playing time and position, but also the fate of the athlete outside of the field or ring. Take OJ Simpson for example, he ran from police for hours after the death of his ex-wife. Several pieces of evidence pointed to him for the double homicide, yet he walked away free as a bird. If it were any other Mr. Simpson besides the one who; won the Heisman in "ÃÂ68, was the #1 draft pick in "ÃÂ69, won four NFL rushing titles, was in 5 pro bowls and was enshrined in the NFL Hall of Fame in 1985#, he would have been convicted of double homicide with no deliberation. The only thing that kept OJ out of jail was the fact that he became a hero through football and was now protected by the politics that engulfed a nation that loved football. You can see that the influence of politics in sports ranges from beginners to retired Hall of Famers. It is sad to think that the parents of young athletes bribe their child's way into the game through simple favors or friendships. Professional athletes move from team to team depending on the money they receive, the benefits they get and how friendly the new squad is. From the beginning of the game until a new past time is adopted politics have and will always influence the way the game is played. Alex Rodriguez bats in a game on April 19, 2008. 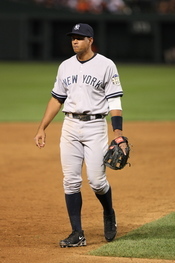 English: Alex Rodriguez, New York Yankees player. WriteWork contributors. "Politics In Sports" WriteWork.com. WriteWork.com, 14 May, 2001. Web. 20 Apr. 2019. Colombia U-20 World Cup Effects of organizing a Sport Mega Event on a Nation struggling economically. "Institutional Arrangements and Sporting Leagues"